Pom poms - the cutest knitted accessories? Home » H.A. 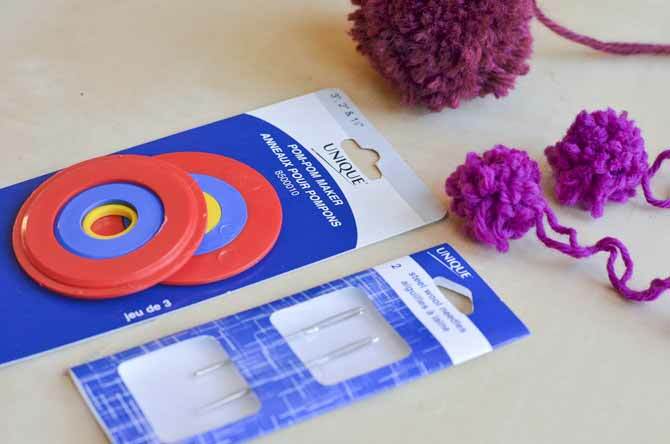 Kidd knitting supplies » Pom poms – the cutest knitted accessories? Pom poms make darling decorations on their own, and the perfect finish for winter hats and mittens. 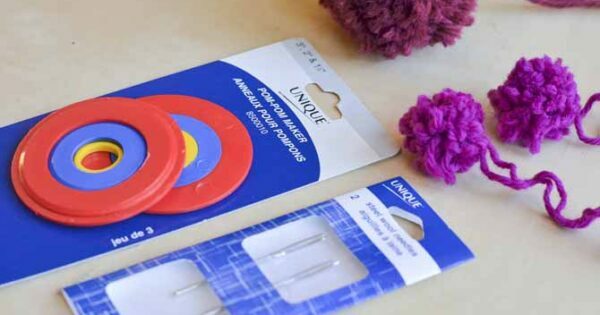 You just need these tools and your favorite scrap yarn! Pom-poms are one of the final flourishes that can take your finished knitting to the “next level.” They’re often used as an accessory on top of a knitted hat, or at the edge of a mitten cuff. You might even have seen them attached to the corners of baby blankets, or the ends of scarves. These little darlings are very versatile! There are a lot of “low tech” ways to make them, but if you want that almost magazine-looking quality, try using a pom-pom maker (pictured above). They will give your pom-poms a symmetrical, polished quality that’s hard to beat, and also come in different sizes for different pom-pom needs. In the photos below, I’m going to show you how it works! The results are hard to beat. Step 1: Hold the pair of rings together, smooth sides out. Begin wrapping your yarn around the rings. First, gather your materials. You’ll need a bit of scrap yarn (any weight will do – I’m using worsted-weight wool to demonstrate these), your pom-pom maker in the size you prefer, and a dull tapestry needle/wool needle for the smaller sized pompoms if that’s the size you’re making. 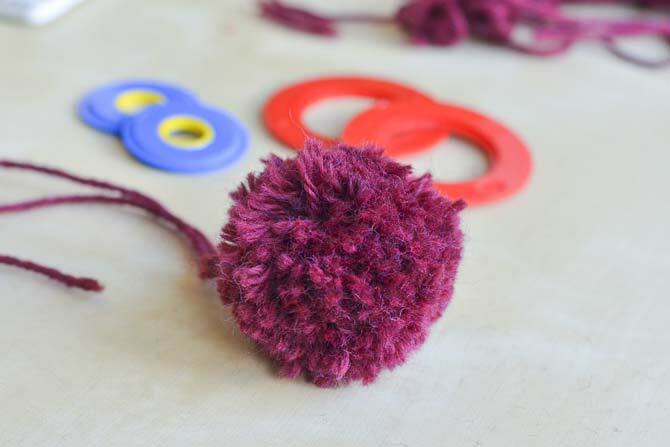 The pom-pom makers I’m using in this demonstration come in 3 sizes that all snap together. This means you can use one size at a time, or combine 2 or 3 sizes together to adjust the size if you wish. All ready? Let’s start our pom-poms! Step 1 (pictured above): begin with the 2 pom-pom rings facing together with their ‘flat’ side out. 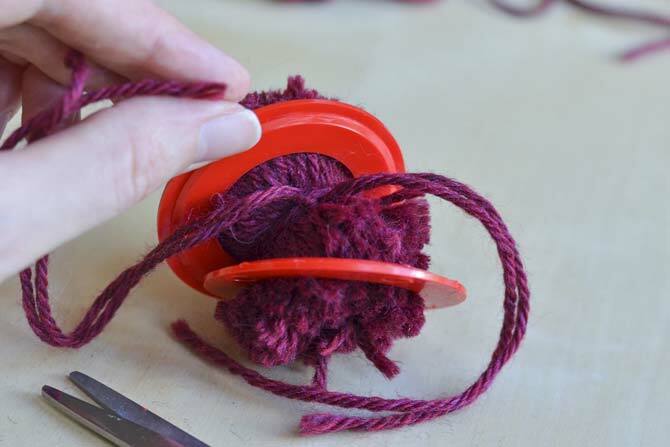 start wrapping your yarn around both of the rings together, and keep wrapping all the way around. Step 2 (pictured below): keep wrapping the yarn until it’s as thick as you want it to be. The more you wrap, the more solid your pom-pom will be. I recommend wrapping it at least twice around all the way, but keep wrapping more if you want a really sturdy pom-pom! Step 2: Continue wrapping the yarn until it is at least twice covered by the yarn, or as much as you want to keep wrapping! If you’re using the smaller pom-pom makers, it’s easier to use a tapestry needle to thread the yarn through the smaller hole in the center. 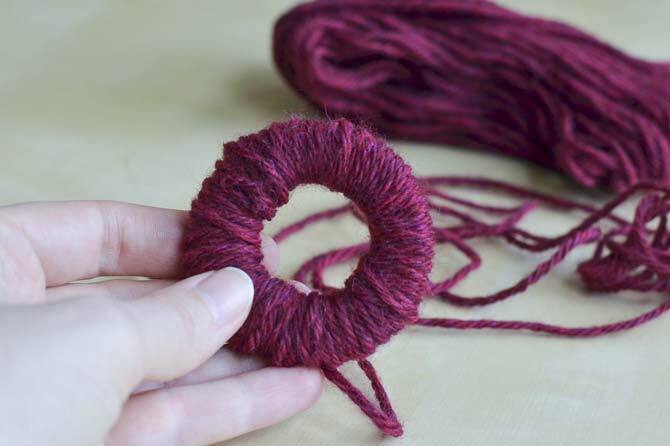 Step 3 (pictured below): Once you’ve wrapped the yarn as much as you want to, hold the rings – which now resemble a “yarn doughnut!” – firmly in the center, and start cutting all around the outside edge of the rings. 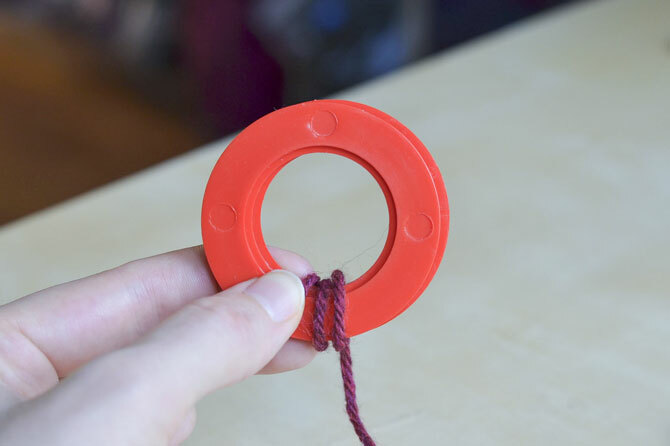 The first time I tried this, I worried the yarn would simply fall out of the center of the ring and that it wouldn’t work at all. I was wrong! As long as you’ve created enough yarn wraps, the yarn will simply rest nestled up all the strands together in the center. Step 3: Cut the wrapped yarn along the outside center edge of the ring, while holding firmly in the center. Step 4: Slowly pull the rings apart so that the center of the yarn is exposed. Don’t remove the rings completely. 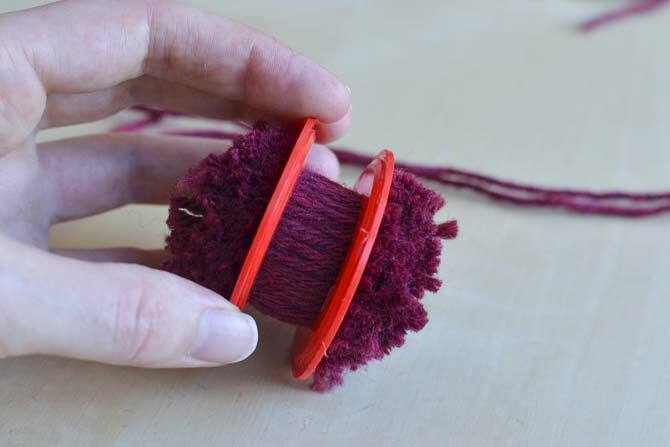 Step 4 (pictured above): Slowly pull the two rings apart, to expose the center of the little yarn bundle – but be careful not to completely remove them. This will look a bit like two jellyfish stuck together. Step 5 (pictured below): With the center of the yarn bundle exposed, tie 1 or 2 longer strands of yarn around the whole works, and tie a knot firmly. Now it’s safe to remove the rings! Step 5: Using 1 or 2 longer strands of yarn, tie them firmly around the pom-pom yarn bundle. Be snug! Step 6 (pictured below): Once you’ve removed the rings, all that’s left to do is snip away any uneven ends and then give it a “floof” with your fingers, and you’re done! It’s a perfect little pom-pom, ready to adorn the top of your next winter hat. 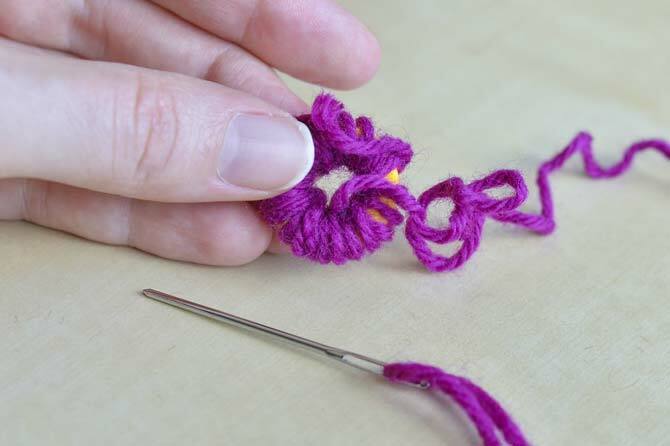 Step 6: Snip away any uneven pieces of yarn, give it a “floof” with your fingers, and you’re done! If you keep your pom-pom maker handy in your knitting tool-kit, you’ll be ready to finish your hat and mittens if they call for pom-poms right away. 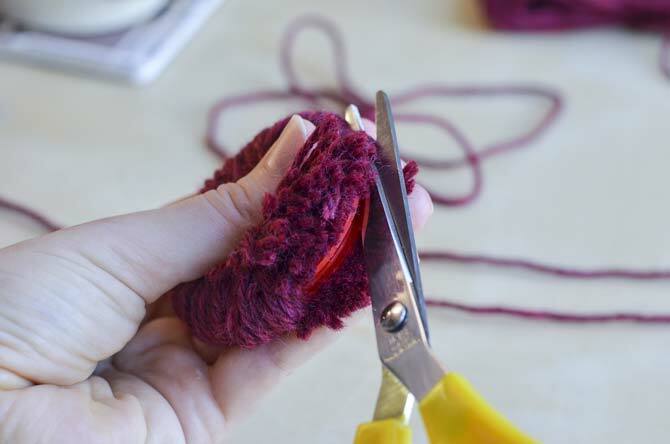 Or, you can make a few at a time when you come to the end of a project, as a way to use up small amounts of extra yarn. Pom-poms make great little decorations on their own, or strung together to make a garland! Pom-poms are gorgeous final flourishes to take your knitting to the next level.